Papers: 1835-1861. 70 items and ca. 2 inches of photographs. Letters and documents written by Douglas as register of the land office in Springfield, Illinois secretary of state, Illinois Supreme Court justice, U.S. representative, and U.S. senator. Finding aid. Papers: 1848-1861. 2 inches. Chiefly letters to Douglas detailing political views at the time of the 1860 convention and letters (1848-1854) concerning the management of his Martinsville, Mississippi, plantation and sale of his goods in New Orleans. Fragile papers restricted. Papers: 1834-1861. 5 inches. Chiefly legal documents from his years as an attorney and judge; poll books (1836-1844), including 1843 and 1844 congressional elections; and photographs. Finding aid. Additional Papers: 66-page manuscript biography (undated) in the Joseph Wallace papers; and manuscript notes on speech in reply to Senators Clayton and Butler on the Central American Treaty delivered in the U.S. Senate March 10 and 17, 1853 in the Jesse Jay Ricks collection. Finding aid. Papers: A note to Douglas concerning the format of their debates in 1858 in the Abraham Lincoln papers, 1841-1865. Papers: In Samuel Sullivan Cox papers, 1852-1902; and a poem concerning the laying of the Douglas monument in the Benjamin Brown French papers, 1864-1866. Papers: 1-volume minute book (1858-1860) of Democratic Douglas Association for 13 Ward A, Philadelphia; correspondence in Lewis S. Coryell papers, 1806-1867; and James Buchanan papers, 1775-1868. Papers: 2 items (1857); correspondence in Jesse W. Fell papers, 1806-1957; and photographs. Papers: 2 volumes (October 11-November 2, 1860) of stenographic notes of his speeches; 2 letters (July 21, 1857 and March 1, 1860); information in William Marcy Tweed letters (bulk 1854) to James J. Murphy; and his eulogy is discussed in a letter (September 3, 1862) from John W. Forney to George W. Kendrick. Papers: 1 letter (October 24, 1859) in the Henry J. Raymond collection. Papers: 1 item (1859); and 6 items (1851-1859 and no date) on various topics in the Gilder Lehrman collection. Finding aid. Papers: In Leonard Wells Volk papers, 1845-1957 (bulk 1845-1892), on partial microfilm reel. Papers: Patronage letters in Nathaniel Greene Wilcox papers, 1834-1874. Finding aid. Papers: Ca. 1833-1861 (bulk 1855-1861). Ca. 23 feet; 19,600 items. Chiefly letters received. Finding aid. Papers: 1832-1861. 515 items and 1 folder. In part transcripts and photocopies. Correspondence, chiefly relating to his activities as U.S. senator, an autobiography (1838), printed material, and clippings. 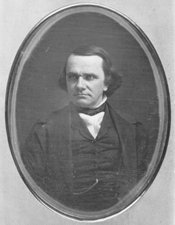 Parts of the collection have been published in The Letters of Stephen Douglas (1961). Finding aid. Papers: 1859, 1860. 2 items. Additional items in various collections. Research Libraries Information Network In addition to the institutions listed above, items are also cataloged in collections at: Alabama Department of Archives and History, Montgomery, AL; Brigham Young University, Special Collections, Provo, UT; Cornell University Libraries, Ithaca, NY; Daughters of Utah Pioneers Museum, Salt Lake City, UT; Granger Homestead Society, Canandaigua, NY; New York City Municipal Archives, New York, NY; Ontario County Historical Society, Canandaigua, NY; Rosenbach Museum and Library, Philadelphia, PA; State Historical Society of Wisconsin, Madison, WI; University of Oklahoma, Carl Albert Center, Congressional Archives, Norman, OK; and Yale University Library, New Haven, CT.